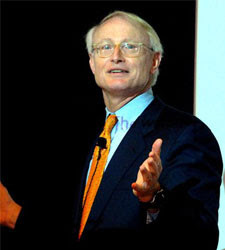 Professor Michael Porter, Harvard Business School on the topic of Strategy at the World Business Forum. Times like these the need for strategy and planning could never be more important. But there is still a lot of confusion about Strategy and what it is. What are the core principles that are going to determine the success of an organization? Have to start with thinking about the competition – the competition to be the best vs the competition to be unique. The worst error in strategy is to compete with rivals on the same dimensions. You create a competition that you can’t win. A good question to ask yourself when it comes to Strategy is: What unique position will you occupy in the marketplace that gives you a sustainable advantage? As a corollary to that a good strategy starts with appropriate goals. Then there is the issue of shareholder value. There has been a big shift over the last few decades to enhance shareholder value. Shareholder value isn’t a goal – it’s a result of delivering superior value to your customers. Stock price is a very bad guide for determining the value of a company or determining a strategy for a company. So what’s a clear strategy look like? – Different way to deliver the service – where and how you deliver the car – at home! Whole Foods – another example of a company with a clear strategy and with a clear social dimension. Which also makes it hard to imitate. His advice for this market is – Don’t overreact to these times – make sure you are making changes that map back to your strategy. Hone in on your strategic core rather than slashing and burning. Need for strategy has never been great and the need for strategic thinking has never been greater. Reflect on these points and he is confident that we all will prevail. I can say he was harping on the fact that you need a strategy in place for at least 3 years to ensure it gets instantiated. But in this fast paced information led economy we find ourselves in (as you suggest) is that even realistic? Business leaders need to have a strategy for providing direction; however, often developed and communicated strategies are difficult to translate into specific employee actions. One organization communicated a strategy of “expansion of production capacity.” Is this the right thing for all produced products? This would not be true for most situations. Organizations often lead from a strategy, which can change over time and with leadership changes. Strategies are important; however, is it best to have strategy-building as step one from which organizational metrics and operational goals are determined? Jim Collins in “Good to Great” describes a level five leader as not only a great leader when they are at a company but the company maintains greatness when the leader leaves the company. The question I ask is: can a company have a “level five” system, if leadership orchestrates the business from a step-one-strategy-building system. I don’t think that it is possible to create a level-five system leading from a built-strategy-first system, unless current leadership, which is doing a great job, can be cloned. I am not saying that strategies are bad but an organization can find it more beneficial if they first build a long-lasting value-chain system (i.e., functional operations with 30,000-foot-level performance metrics), which maintains stability through leadership changes; i.e., a potential “level five” system framework. From a value-chain, an overall business governance system could then blend analytics with innovation to determine targeted strategies that benefit the enterprise as a whole. This whole-enterprise assessment can be made relative to satellite-level (financial) tracking metrics, which can have revenue growth and profit margins goals. Integrated Enterprise Excellence (IEE) provides a framework that addresses the above described issues. In IEE, strategy-building is step five of a nine-step process. IEE helps an organization not only create effective strategies but also helps organizations move toward achievement of the three Rs of business; i.e., everybody doing the Right things and doing them Right at the Right time. Attention-grabbing detail. Appreciation pro the info!